It can be disheartening to discover that your office has been broken into. You own and operate a successful business. You and the team were on the cusp of breaking the market wide open. Now,unfortunately, you have to deal with an inconvenience that does more than risk your office space. It risks the peace of mind and physical safety of your employees. This is why you need to hire a local locksmith in Paramus. As a business owner or operator, an office break-in carries it’s fair share of weight. Similar to home break-ins, a commercial break-in threatens more than monetary losses; it prods the deep seated paranoia we all share. Break-ins lead to questions that we’ll never have the answer for, and only gives a partial answer — one that infers you and your employees are not safe behind locked doors. Many of the commercial clients that come to Firstline Locksmith due to a break-in feel overwhelmed. If you’re a business owner or operator, we understand. You’re already working triple-time to keep your business functioning smoothly. You do not want to deal with an office break-in right now. Here are some tips to secure your office after a break-in. During this step, you want to get a “lay of the land.” How did the break-in happen? Which security measures were thwarted? Why did the criminal choose one entrance over another? The more information you can gather, the easier it will be for a local locksmith in Paramus to assist you in re-securing your office. You will want to assess the internal and external security measures you have in place and those that were compromised. Was it an inside job? Did the criminal break-in or did they stage it? Although you will be filling a police report for the event, you will want to know this so that your local locksmith can better serve your commercial security needs. Once you’re aware of what and how the break-in occurred, you can begin to decide what you can afford to deter another break-in and secure your office space. This typically falls in line with estimating potential expenses for locksmith services, security measures, upgrades, and more. Furthermore, you will probably be speaking to a handful of locksmith companies offering commercial locksmith services in Paramus. Get as much information from them as possible before making a decision. 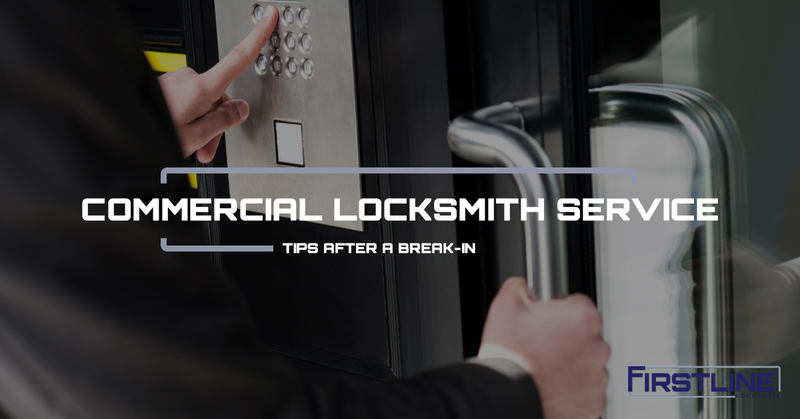 Now that you have an idea of what happened, what needs to be fixed, and how much it may cost, it’s time to schedule either an on-site appointment with a professional locksmith, or to hire one to take care of your office space security needs. In most cases, you will want to get an estimate in writing, so that you know exactly which services are being provided and what lock technology is being implemented. Once you have new door locks and security access measures, you still need to address your employees. If you made the decision to upgrade your office security, which Firstline strongly suggests you do, then you will need to introduce the new upgrades to your employees. They do not need to know the inner workings of the security system, but they do need to know how it will affect their daily lives at work. When you implement new security measures, you will need to allocate time and/or money to maintain it. A common misunderstanding is that commercial security is a “set and forget” commitment. The opposite is actually true. If you want effective security for your business, you need to dedicate time, money, and, potentially personnel to keep it up and running. As the industry veteran, Firstline Locksmith serves Paramus and the greater New Jersey area with commercial locksmith services. Did your business experience a break-in? Are you overwhelmed with how to move forward with your commercial security measures? At Firstline, we work with the retail, banking, and many more industries, assisting each business in establishing a highly-effective security protocol that protects assets and people from break-ins. Want to discuss your commercial security? Contact Firstline today!